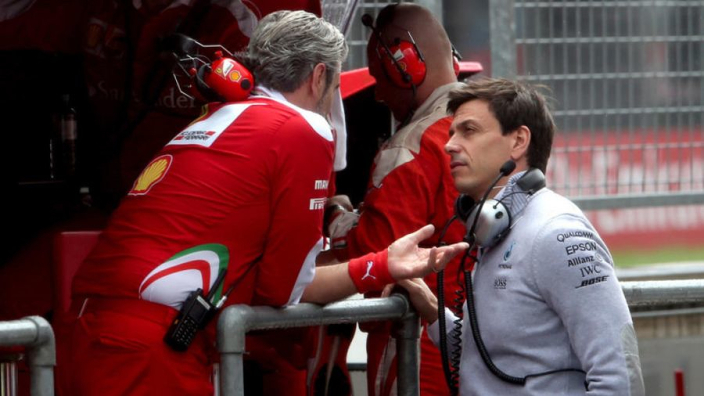 Toto Wolff says Mercedes and Ferrari are unable to enjoy an "amicable" relationship during the heat of mid-season battle, but says Formula 1's biggest rivals are able to discuss the future of the sport in a more constructive manner now that the campaign has finished. Ferrari have finished second behind Mercedes in three of the last four seasons, gradually coming closer in the past two years. Both teams often treat the other with suspicion and 2018 was no different, with Ferrari's boosted engine power and a new style of wheel rim brought by Mercedes drawing accusing glances from nearby garages. However, both the Silver Arrows and Scuderia have found common ground in recent months with concerns over Liberty Media's vision for the future of F1 – something that may come back into focus now the teams can discuss matters more openly. "I think it is very difficult to maintain a very amicable gentleman attitude during the season when each group is obsessed about winning," Wolff told Motorsport. "We can see that things are coming back to normality now, because it is our joint platform and we need to make it function. "We need to have a relationship to discuss things and that is why I think it is completely normal that there are times when it is more difficult and there are times that it is easy. "Those times where we talk to each other in a productive way are very important for F1, and for us as teams."